As a hybrid robo-advisor, Personal Capital offers access to human advisors. Fees are on the higher end, but anyone can use the free tools. The Bottom Line: Personal Capital’s fees are on the higher end, but anyone can use the robust free tools. Free, comprehensive investment management tools. In the world of financial advice, robo-advisors sit on the cheap end of the spectrum and financial advisors on the expensive end. And then there's Personal Capital, which targets the $100,000-plus investors with a hybrid model combining robo-advisor algorithms and human advisors. Account balances of $200,000 or more get assigned two dedicated financial advisors; those below that have access to a team of advisors. Personal Capital's high-touch approach comes with high account management fees: 0.89% per year, though large account balances — $1 million or more — earn discounted rates. But that higher fee does come with a slew of financial and investment planning tools (some of which are free to non-customers), the ability to link existing accounts and track spending, net worth, portfolio performance, retirement progress and fees. Finally, Personal Capital offers a socially responsible strategy, which allows users to build portfolios that align with their environmental, social and governance values. New this year is a retirement paycheck feature, which helps clients to plan their withdrawals come retirement, including tax-optimized withdrawal strategies. Investors looking for free financial management tools. Clients with $100,000 to $200,000 in assets: Invested in a portfolio of exchange-traded funds that carry a weighted average expense ratio of 0.08% and are designed to be tax efficient. Personal Capital uses a portfolio selection process it calls Smart Weighting, which invests equally in all sectors, rather than mimicking an index like the S&P 500. This process isn't unique to Personal Capital; other sources refer to it as smart beta. Clients with $200,000 to $1 million in assets: All the benefits as above, as well as the ability to customize a portfolio that includes individual stocks and ETFs. Clients with $1 million or more in assets: All the benefits as above, in addition to the ability to invest in individual bonds. Personal Capital's personalized approach takes a holistic view of a client's financial picture — not just the assets it manages. The company says its portfolio management strategy reduces risk while increasing returns, the holy grail for investors. In Personal Capital’s hypothetical backtests, the strategy outperformed the S&P 500 by more than 1.5% annually, with lower volatility. It also allows the company to find individual tax-loss harvesting opportunities. Because Personal Capital uses individual securities, it can easily target these and sell them as needed, as Wealthfront does in its direct indexing service. In 2018, Personal Capital introduced socially responsible strategies, which screen U.S. equities based on environmental, social and governance factors. By mid-year, these strategies had surpassed $125 million in managed assets, according to the company. Tools: Personal Capital offers are a variety of free and comprehensive tools, including an investment checkup, a 401(k) fee analyzer and a spending tracker. Though you must create Personal Capital login credentials to use them, you don't need to be enrolled in the company’s advisory service. Once you sign up, you can quickly link your bank, brokerage and credit card accounts. Personal Capital analyzes the asset allocation in your investment accounts based on the information it finds, telling you exactly how much you need to decrease or increase your holdings of certain asset classes to line up with its recommended target. DIY investors can use this advice to make adjustments on their own. Personal Capital also offers spending analysis, a look at your cash flow that divides expenses into categories such as groceries, health care, clothing and restaurants. The tool tracks income sources and bills due for linked accounts as well. The retirement planner analyzes your investment accounts to forecast whether you’ll meet your self-determined income needs in retirement. You can adjust those needs, as well as your expected Social Security income and the tax, life expectancy and investment return assumptions made by the calculator. The tool pulls real-time data from your Personal Capital account and incorporates day-to-day financial activity, updating estimates of retirement spending based on current spending figures. The Personal Capital dashboard, part of the free offering, lets you view your entire financial picture in one place. You can easily view aspects such as net worth, cash flow, portfolio balances and portfolio allocation. 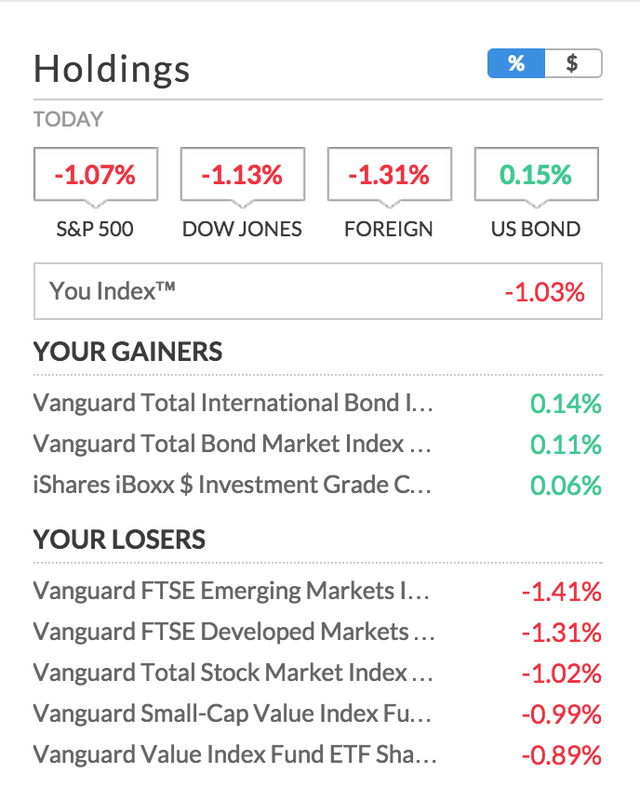 A holdings module shows you how all of your investments are performing, letting you view them by percentage of your portfolio, dollar amount, and whether they’re "gainers" or "losers." The tools and services increase along with the assets managed to include college savings planning; financial decisions support that covers insurance, home financing, stock options and compensation; private banking services; and estate, tax or legacy portfolio construction. Dedicated financial advisors: This is clearly the piece of the puzzle that attracts high-net-worth clients: Those with balances of $200,000 or more get access to two dedicated financial advisors who can answer questions about a wide range of issues, including retirement planning, refinancing, estate planning, taxes and obtaining a mortgage. Clients with $100,000 to $200,000 invested have access to a team of advisors (including certified financial planners and chartered financial analysts), all of whom have a fiduciary duty to clients. These advisors are available via phone, email or video chat. Management fee: Managing your investments with a financial advisor would cost significantly more than working with Personal Capital; the average advisor charges more than 1% of assets managed. If you have $200,000 or more, you'll have access to dedicated advisors and customized portfolios, and Personal Capital likely will save you money versus working with an independent advisor elsewhere. But at other account balances, and stacked up against other robo-advisors, Personal Capital definitely is on the high end when it comes to fees: Investors with under $1 million will pay 0.89% of assets managed; many robo-advisors charge closer to 0.25%. Even compared with similar hybrid service Vanguard Personal Advisor Services, Personal Capital is more expensive: Vanguard charges 0.30% for that offering (up to $5 million), though clients get a dedicated advisor only if they invest $500,000 or more in assets. Betterment Premium, Betterment's answer to the hybrid model, charges 0.40% for unlimited phone access to advisors. Account minimum: At one time, Personal Capital's account minimum was a more-reasonable $25,000, especially for a hybrid service that includes access to financial advisors. However, with the minimum now at $100,000, this offering once again puts the wealth management service out of reach for many customers. » Check out our top picks for best robo-advisors. Is Personal Capital right for you? Personal Capital should appeal to two main kinds of investors who fall on opposite ends of the spectrum: DIY investors who can use the company’s free and comprehensive tools to gain valuable insight into their portfolios, and high-net-worth investors who can deposit enough with the service to gain access to dedicated financial advisors and services you'd find working with a traditional human advisor. Investors who fall in that $100,000 to $200,000 range, which only offers access to a team of financial advisors, can find a similar level of service for less at competitors like Betterment and Vanguard Personal Advisor Services.